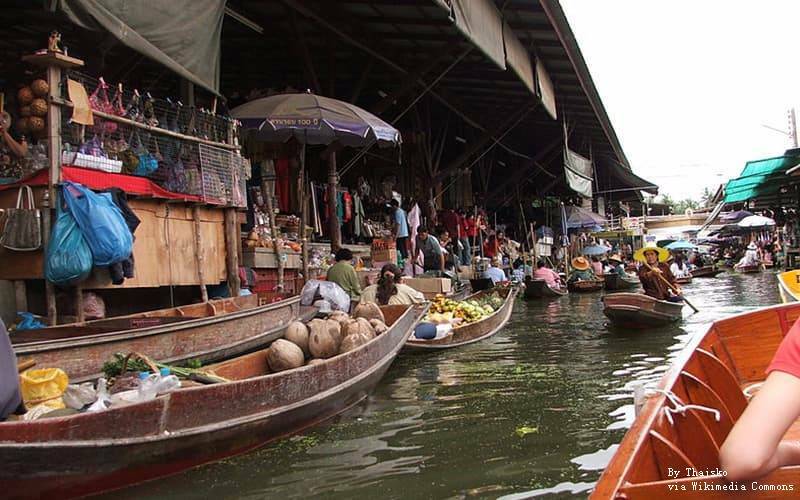 There are three small markets which make up the floating market. These are the Khun Phitak, Ton Khem, and Hia Kui. Khun Phitak is the smallest of the three markets with less crowd. It is located 2 kilometers in the southward direction of Hia Kui. For a visit to a souvenir shop, the canal banks of Hia Kui is filled with these shops. Khlong Damnoen Saduak is where you find Ton Khem, the largest of these three Bangkok markets. Considered the best floating market Bangkok, lots of narrow canals forming a maze make up the Damnoen Saduak Floating Market. Sampans which are small wooden boats are chosen by the female traders to use in selling wares. These traders usually dress in a straw hat and the traditional mo home apparel which is a blue farmers' shirts. From 7 am to 9 am, the market is usually very busy and the activity lasts until noon time. Tourists make up the large crowd of people who visit the floating market Bangkok. This is a key reason why the prices of wares are usually high. It is common to find people bargaining in the market. In most cases, it is possible to get items a few Thai baht lower than the initial price. You can find boat noodles for sale by canoe cooks. 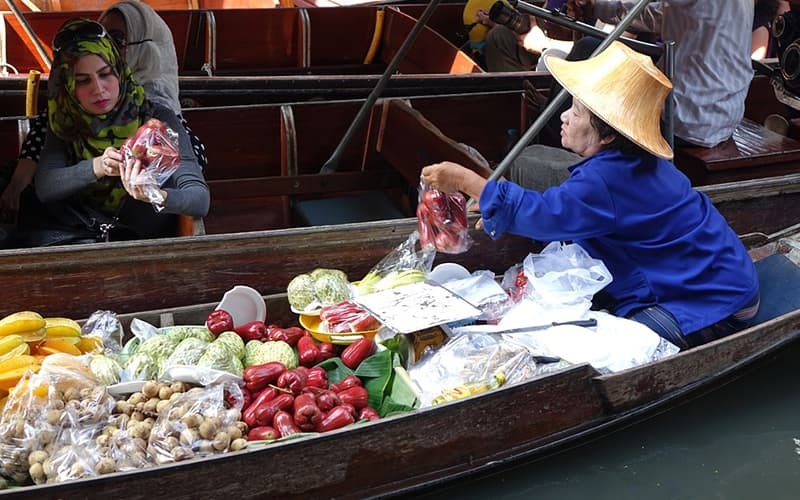 Although both domestic and foreign tourists troop to the floating market, a major complaint is the lack of cultural authenticity. If you hope to purchase small trinkets, local handicrafts, handcrafted jewelry, and assorted silks, then you should visit any of the small stalls set up on the banks. Bangkok souvenirs are also available here. Local products are also available both on the floating crafts of vendors and in stalls. These include a tasty coconut ice cream, mini coconut pancakes, and boat noodles. To escape the walk in the heat, the best time to take off is in the early morning start. This will also let you get there when the crowd is large and the Damnoen Saduak is very lively. 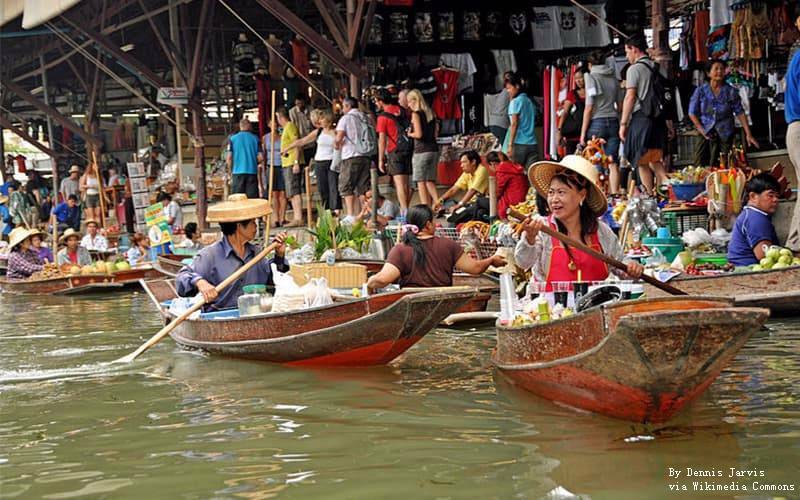 One of the main attractions in Thailand is the floating market. This is why most tourists always make sure they visit this location. This should not deter you as you can have a great time as long as you stay away from shops which attract tourists. Joining a tour is the best way to get to the market which is one hour from Bangkok. By Bus: From 06:00 hours, you can get a public bus every 40 minutes. The buses leave from the Southern Bus Terminal. The distance from Bangkok to Damnoen Saduak in Ratchaburi is around 109 kilometers. This is a drive of approximately 2 hours. The bus fare for a one-way trip is 50 baht. Between 08:00 – 10:00 hrs is the best time to be on the market. Warning: In most cases, it is possible that the drop off point of the taxi or bus may be next to the canal but 1 km from the central area. Although it is quite expensive, it is possible to get a boat for hire. You need excellent bargaining skills as prices usually start from 1000 baht. A common sight on Floating Market Thailand is that of small rowing boats in large numbers with local food and agricultural products for sale to buyers. A lot of these products come from the personal farms of the vendors. This makes it a great place for tourists to view buying and selling in the traditional style. If you are there for sightseeing, you can enjoy a boat trip along the smaller canals. These branch of from the Damnoen Saduak canal. Other sights for visitors include the Thai way of life as well as Thai traditional houses. Other things to enjoy include drinks, local food, and exotic fruits. There are temples which you can visit or simply take a boat trip to enjoy a view of the temples along with a look at the traditional life during the trip. The boat trip is usually very exciting. It gives visitors the opportunity to take excellent pictures and also watch the activities of the market. The trip takes you through the canal passage where you can find various shops and restaurants. Visiting the floating markets is also easy on foot. You can simply take a walk along the canal sides. You can still enjoy the sights of wooden boats with their wares overflowing. The culinary experience in the Damnoen Saduak floating market is unique and impossible to find in any other place. 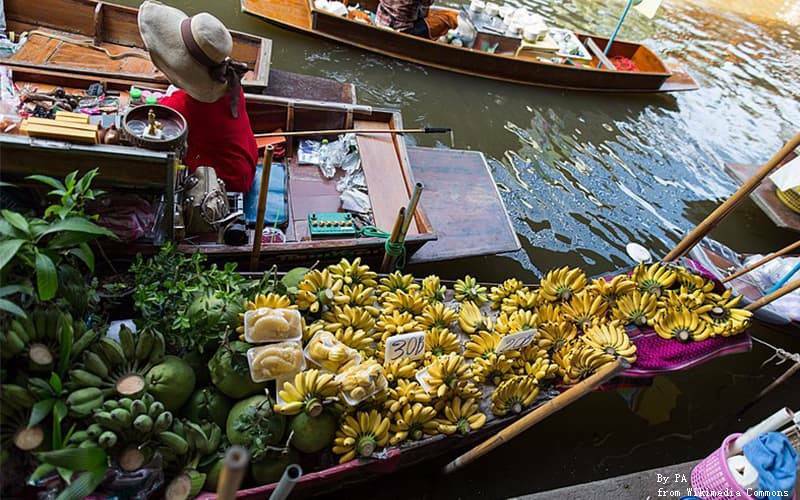 There are lots of exotic fruits on sale by vendors on wooden paddle boats. Most tourists have not heard of, let alone tasted most of these fruits. Sweet treats, vegetarian dishes, as well as traditional Thai meat, are also available. It is a good idea to have your breakfast at the Damnoen Saduak floating market anytime you plan to visit. This is if you are sure you will be arriving early. Look around for a food vendor frying fresh spring rolls or one with a new bowl of noodles over the fire. If you don't want to waste any time, plastic utensils and Styrofoam bowls provided by vendors. Local restaurants are also present along the river. These small restaurants are the best for tourists looking to get a large meal. They offer a variety of Thai foods. You can go for the popular Pad Thai with peanuts, dumplings, sweet seafood salad, or Thai pancakes. Your lunch can be a boat noodle. In the past, vendors on the river and canal sold the noodles on wooden rowboats. Nowadays, roadside shops offer the Boat noodles. Each bowl of the Boat noodles contains pork liver, roasted pork, crispy fried pork skin, rice noodles, pig blood curd, pork balls, with a dark brown soup filling. 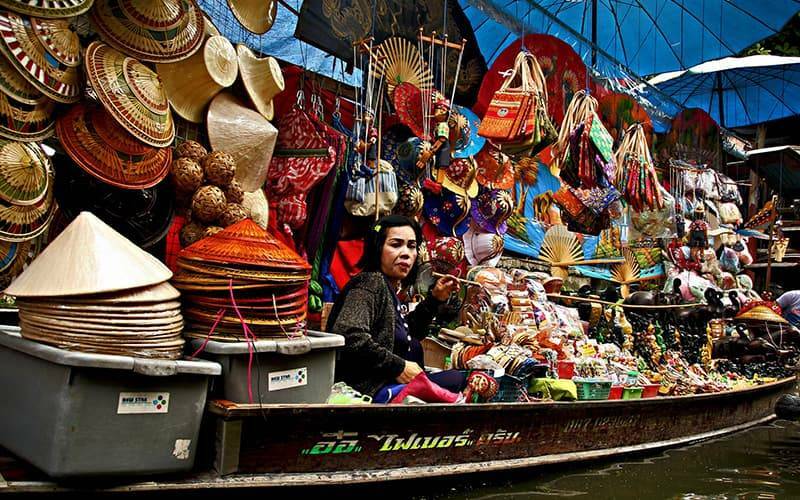 It is not possible for an individual to visit the Damnoen Saduak floating market without picking up a souvenir before leaving. When searching for the best souvenir to brings home, this is the best place to check. Items available include trinkets, clothes, candles, and hand carvings. These items are also very affordable. Although vendors want to sell cheap souvenirs, you can find some excellent gems in the countless souvenirs on display. The initial price of the items can be quite high. Depending on how skilled you are in bargaining, it is possible to cut the price down by 70 percent. The same applies for T-shirts and other items. The Maeklong train market is easy to visit from Damnoen Saduak. You can plan both trips for a single day. Time your visit to fall between 9:30 am and 12 noon. This is because it is a daily morning floating market. If you are not visiting temples, you can go round the market in a one hour ride. Make sure you bargain for the best boat deal. 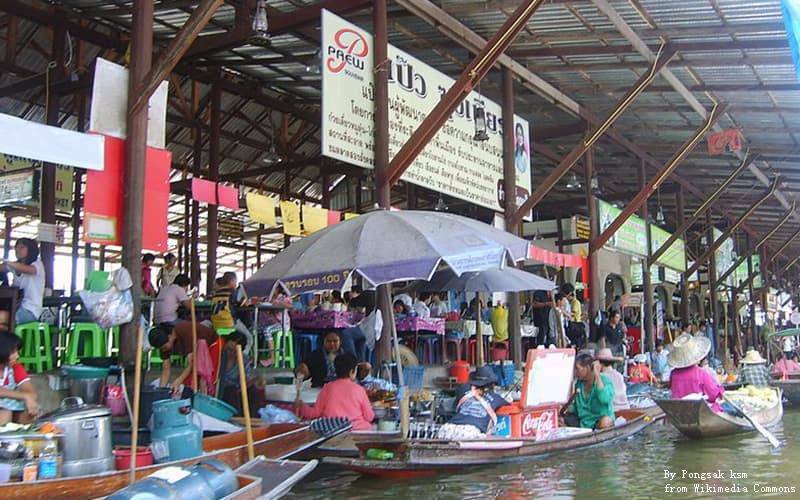 A licensed local guide is your best option when exploring the floating markets. For just $4 or 150 baht, there is a commercial paddled boat ride available. You can explore the main market and get back on a 30 minutes ride using the boat. Prices of souvenirs and food which vendors inside and around the market are usually high. Your best option is to focus on taking pictures during the ride and then go shopping and get a snack after the ride.